For many years the broads were thought to be a natural landscape. It was only in the 1960s it was proven that they were man made and were in fact the result of flooding of early peat excavations dating back as far as the Romans who first exploited the rich peat beds of the area for fuel. In the Middle Ages the local monasteries began to excavate the peat selling it as fuel to Norwich and Great Yarmouth. When sea levels began to rise, the pits began to flood and despite the construction of wind pumps and dykes, the flooding continued and resulted in the typical Broads landscape we see today, with its reed beds, grazing marshes and wet woodland. Our Recommendations….. The Broads offers over 150 miles of lock free cruising and is divided into two distinct areas – the Northern Broads (to the North of Great Yarmouth) and the Southern Broads which extend to the heart of the historic city of Norwich withit’s magnificent cathedral and historic ancient streets and covered market. Perfect for all the family, you can hire a modern sports cruiser offering every home comfort, or if you prefer to experience the Broads in a traditional wooden cruiser dating from the early days of boating, you can hire a Broads motor cruiser or traditional gaff rigged sailing yacht. 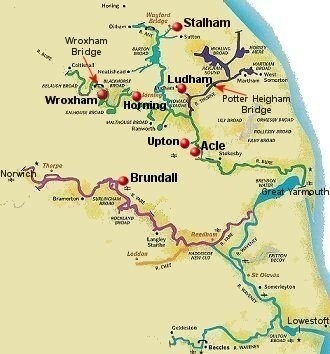 Short Breaks……For a short break, you can explore the Northern Broads from any of the bases above Great Yarmouth. Just remember that the larger boats cannot pass through the two lowest bridges at Potter Heigham and Wroxham, but don’t let this put you off as there is still plenty to see and do! You can also start from Brundall and enjoy a city break by navigating your boat to the very heart of Norwich. A week’s cruising….. A full week will allow for a trip through both the Northern and Southern Broads so it is not so important where you start from so much as finding a boat which will best suit your needs and give youthe most enjoyment from your holiday.